Earlier this week I wrote part 1 on investing in Nebraska Tax Liens, which addressed more of the how to get started. Today I’m focusing more so on the pitfalls, how to ensure success, and the process of foreclosing on a tax lien. I only learned about these through reading a number of books and from my own experience of participating in three Nebraska Lien sales. Like I described in my previous post there are some risks to investing in liens. One of those pitfalls is investing in a parcel that has multiple years of back taxes owed against it. What that means is in the previous years other investors knew that this parcel was a money losing investment so everyone passed. That should be your first alert that it’s a bad investment! If multiple years of back taxes are owed, then typically the assessed value of the property is worth less then the back taxes or the parcel has a lot of improvements that would cost more then the possible investment returns. Another pitfall is buying a lien and then finding out the property is a dud. Dud meaning it’s a condemned house or a parcel of land that can’t be developed on. An example of a condemed house is one that has multiple city code violations against it that are required to be fixed before you can foreclose. To name a few would be structural, electrical, or environmental hazards. An example of a parcel that can’t be developed on would be a drainage ditch or one that has it’s zoned area that can’t fit a store or house on it – EVER! All these can leave you with a bitter taste in your mouth, and make you gun shy of investing in liens. What that typically means is that the property has some significant value, and that you should be able to recoup your investment should you need to foreclose. That is why having the assessed value amount information is so important. Here is a little snippet from my cheat sheet from the Douglas county tax lien sale I participated in last year. In column H is my decision equation. “=IF(%Owed<=0.05,”Yes”,”No”)” This makes it real easy when it comes time for the auction to have a yes or no answer. Most of the major banks and investment firms hire college students to bid in lien auctions and almost all of them have similar type sheets that say, Parcel ID and a Yes or No decision. Makes it almost dummy proof, huh? The above technique works for a lot of the lower assessed value developments, but once you get into the $500,000+, then you really need to do more homework. With those larger developments the amount of risk is substantially more because you are investing probably $20,000+ into just one lien. If you’re a small investor you’d want to ensure that there is limited risk. One way I see a lot of people further reduce their risk is to drive by each of the properties you are going to bid on. This way you can know for sure if the lien and assessed value are really true. When I explain tax liens to people one of the first questions is, “what happens if they don’t pay back their tax lien?” Well in Nebraska the law is that if the owner doesn’t pay back his owed taxes in three years, then you are allowed to foreclose on the property (if you’ve paid all the subsequent taxes in those three years). After those three years have passed the first thing I do is get a qualified lawyer (one whose done tax lien foreclosures before). One of the first things they do is request a copy of the county’s records of who else has a lien against the owners property. The law firm will then notify all of the lien holders on the property that “My_Company” will be foreclosing on the property in 90-120 days. This gives all the other lien holders (like a bank) ample notice to pay off the back taxes (pay me) and remove the lien against the property. Most banks usually step in at the last minute, because they don’t want to risk losing a home over a relatively small amount of back taxes owed. That is why only about 3% of tax liens end up in foreclosure. So if back taxes aren’t paid in those 90-120 days, then your lawyer will help you finish out all the legal processes. Then you’ll be a brand new owner of a house or plot of land for only a few thousand dollars in most cases. I personally have never foreclosed on a property, but I did have one Iowa tax lien that hadn’t paid back their lien in two years (two years is the length of an Iowa lien), and contacted a lawyer to start the foreclosure in 90 days. They followed the above process, but one of other lien holders ended up paying the back taxes in the 90 days. Either way I earned 24% interest on the lien for 2+ years. Not a bad investment if you ask me, regardless if I didn’t get to foreclose on the property or not. Reminder – Also keep in mind that if you are looking at investing in Nebraska tax liens this year that the counties will soon be posting their liens in a couple of weeks. So check out a few of the Nebraska county assessor websites. 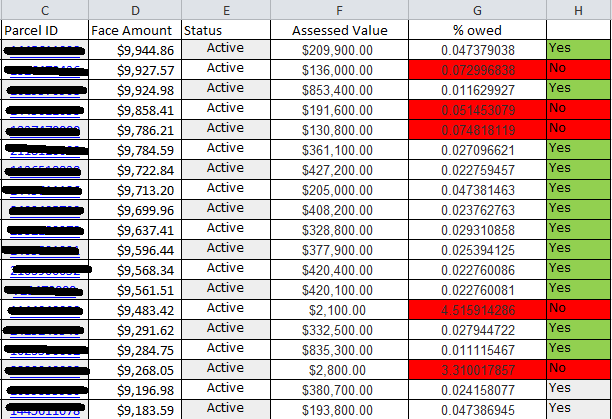 Where do you get the assessed value that is in your spreadsheet? All the 2019 Douglas County Tax Certificate File on their site shows is the Taxes Owed? Thanks! What happens if the tax certificate is redeemed less than 30 days after you bought it? Basically, I am trying to understand when is the interest applied? I assume it is compounded monthly. So if the owner redeems the certificate before 30 days, do you still get a prorated interest payment on the delinquent tax value or is it just a break even? Also, where do you get all of the property values from? The counties that I looked at don’t show the value, they only show the taxes owed. It seems very labor intensive to look up each property on the county website. I notice you are in the IT world. Do you have a scrubber API that you have coded? Like Zillow? Feel free to email me any responses you don’t want on the web. So how do you recoup your principle if you miss even 1 of those subsequent tax payments within the 3 years? I ask because you said you need to have paid all subsequent taxes in order to foreclose. Also your claim to the property would have to trump any creditor’s/lien holder’s in order for you to end up with the property. Is this the case? Sounds wild. If you don’t hold all the liens, then you’d need to work with the other lien holders to foreclose on the property. Please consult a professional lawyer for a legal perspective. would you be willing to provide some additional detail on how you arrived at your 5% ratio? What is it based off of? I didn’t have any rhyme or reason to how I came up with 5%. That is just how I figured that the property was worth something and there wasn’t a lot owed on the assessed value, so I could take a risk without seeing the property. How long I it in Nebraska to firclise in tax lein proprties? I takes three years to foreclose on a Nebraska Tax Lien.